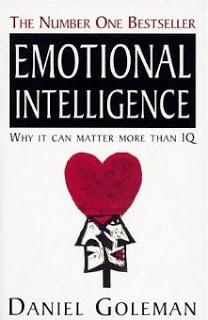 The concept of emotional intelligence was introduced in the 60s and rose in popularity with the release of Daniel Goleman’s 1995 book Emotional Intelligence – Why it can matter more than IQ. Emotional intelligence is understood as a kind of fluency with the emotions of oneself and others and interpersonal skills that are outside of what we generally think of as intelligence. All throughout the history of Spearman’s general intelligence factor, g, critics have taken issue with the use of just a single human element to encapsulate intelligent behavior. Some of this criticism has suggested that aptitude with emotion is just as or even more important than the cognitive focus of classical intelligence tests. Gardener’s multiple intelligences and other theories have long held that interpersonal skill and emotional awareness deserves appreciation independent of general intelligence. The intuitive and popular appeal of “EQ” meant it was embraced by the public – but largely unaccepted by most scientists. Research into what exactly constitutes EQ and how best to measure it continues, building on a body of work that supports EQ as a useful psychometric construct. Goleman claimed that EQ explained almost three quarters of leadership ability, and that people with higher emotional intelligence are more emotionally resilient and higher functioning at their occupations. Q: Imagine you notice a small child crying after being excluded by her peers on the playground. What is your response? Of course, the “correct” answer to the above is not obvious, and the fact that all the answers could be reasonably defended shows how difficult it is to assert absolute validity when it comes to emotional intelligence tests. Much criticism for the construct of an emotional variation of intelligence is that it is simply not distinct enough from g or other well-examined personality traits, such as conscientiousness, with which it shows occasional correlations but no causal relationships. For example, some studies have shown that the impact of EQ is insignificant when general intelligence and personality are controlled for. A more serious criticism, however, is one that questions the validity of calling various emotional or moral behaviors “skills” in the first place, rather than seeing them as idiosyncratic qualities or characteristics. Many have claimed that research into emotional aptitude is not a real threat to the validity of general intelligence since the former has nothing to do with cognition and so is excluded by definition. But does that mean that emotional intelligence has no use at all, even as an accompaniment to a score for general intelligence? Unfortunately, EQ scores have also shown very little predictive validity and fail to show a robust relationship with real world performance, leading to questions of any useful application of such tests. Part of the reason could be that so many tests of emotional intelligence rely on faulty measurement methods. For example, self-report tests are incredibly vulnerable to people simply answering in the way they believe they should. In the example above, a person may choose the answer they think best demonstrates empathic, emotionally aware behavior, because this behaviour is socially desirable, and not necessarily because that’s what they’d do in a real situation. While emotional intelligence has popular appeal, most researchers today approach the phenomenon not as a challenge to more traditional cognitive definitions of intelligence, but rather a separate area entirely, one more akin to personality, or even as a phenomenon not suitable for scientific investigation at all.